What is a Spanische Windtorte? So, what actually is a Spanische Windtorte? We’ve come across a few weird and wonderful things over the past few years on The Great British Bake Off but this next technical challenge has got our minds boggled. A Spanische Windtorte is an Austrian dessert made with Viennese meringue, whipped cream and summer berries and finished with fondant violets. This impressive dessert it a complex creation that will push any baker’s piping skills to the next level. Also known as the Spanish Wind Cake (we hope it refers to the weather!) this cake was once named the fanciest cake in Vienna and we can see why! Dating back to the 17th Century Baroque period, this cake is influenced by both Austria and Spain. Our mummy blogger Anneliese has been baking along with this year’s Bake Off and said that this technical challenge was one of the hardest yet. 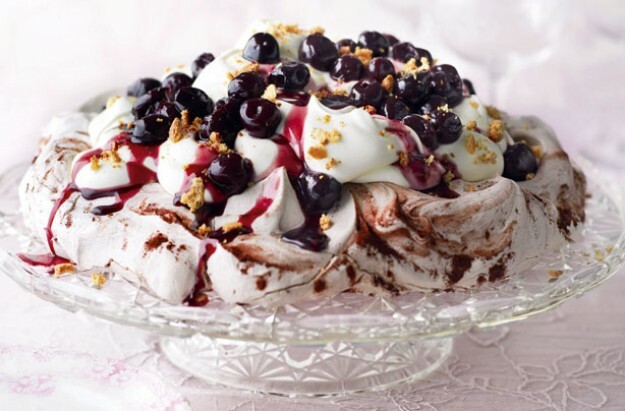 Think of it as a giant pavlova filled with a creamy, fruit filling. Sounds a little less daunting, right? Make your favourite meringue recipe, shape into a large round pavlova, whip up some cream, add fresh berries, fill and serve. You can sell it to your friends as a Spanische Windtorte – they’ll never know! To Windtorte or not to Windtorte? So, what’s the moral of this sticky meringue story? If you’ve got 5 hrs to spare, patience of a saint and hands as steady as a surgeon, roll up those sleeves and take on this terrifying tower of meringue. Or, just sit back and watch this year’s bakers struggle. The choice is yours!